Hi there! 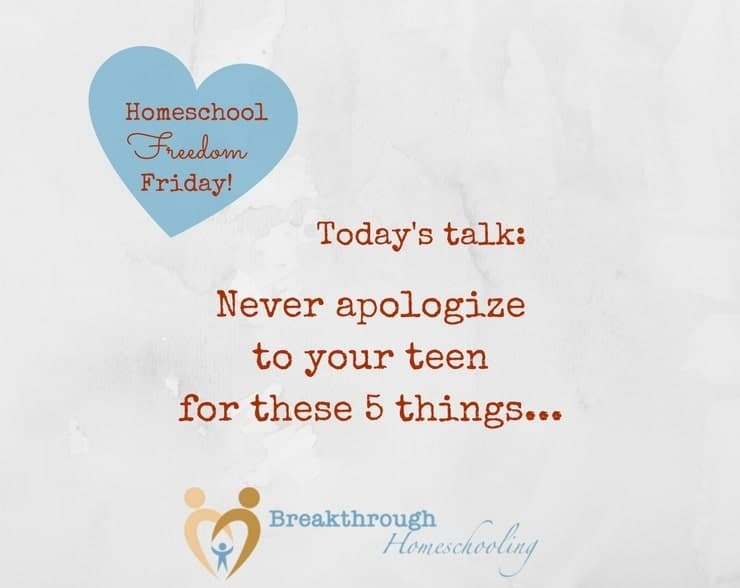 Welcome back to Homeschool Freedom Fridays! Today I’m sharing my take on some things you should never have to say “I’m sorry” about… I think you’ll agree with them, too! Parenting teens can sometimes be a little bit tricky! They are looking ever more closely at us as they seek role models for adulthood. At the same time, they are trying to discover their own way of growing into that role. While I do think that it’s important for parents of teens to admit to and apologize for mistakes as we make them, I also think there are some areas where we should stand our ground. There are some situations for which we should make no apologies whatsoever! ← #breakthrulinkup 28 – It’s “Ultimate Bundles” Time Again! 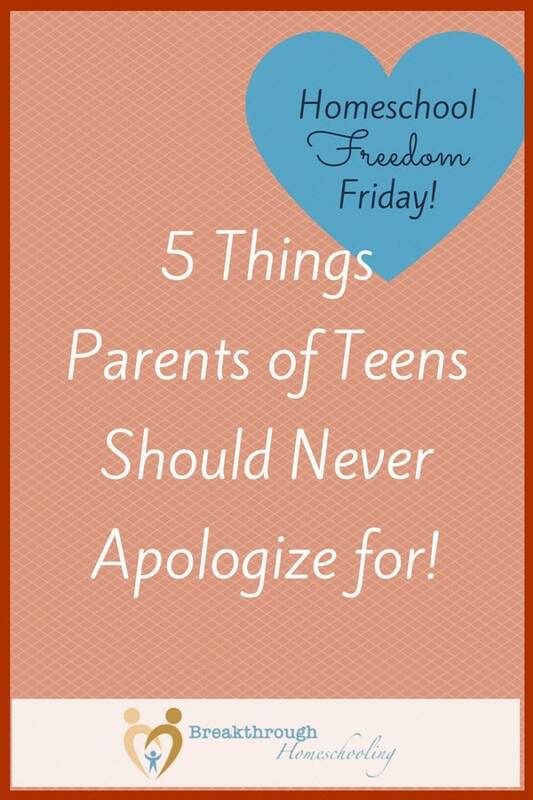 I agree, there are no apologies for these 05 things, because as parents all these things are a way to show our care and concern. Have an awesome weekend, and thanks for stopping by! Your post somehow got by me…Thanks for the kind words, and for stopping by! Good luck with your blog! Enjoyed today’s blog. I am the 75 year old lady from TN. Loved all 5 of the things that you went over. I’m a grandmother who has raised her grandson most of his life. Now he is ready to make a decision about his future. He was going into the Air Force but he is having a problem with one of his legs. So now he is working in a factory and I do hope that he doesn’t contain that for long. Your prays are asked for him. His Mom is on drugs. Oh Becky, I have added him to my prayer list. I’ll also be praying for you, as you seek strength and wisdom dealing with him. My heart goes out to you, but remember – He is able! God’s got this, and we can trust Him in all things. As much as you love your grandson…God loves him even MORE!